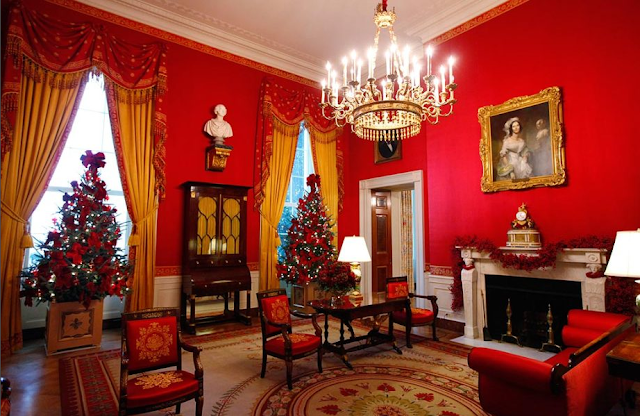 The Red Room Christmas trees are appropriately decorated all in red with red ornaments and large red ribbons. The room's fireplace is dressed with a gorgeous red berry garland to match. The State Room Christmas tree is decorated with ribbons and ornaments along with natural elements such as pinecones, berries, branches, honeysuckle garland, and dried flowers. The Cross Hall contains two Christmas trees dressed with glass ornaments, pine cones, and red ribbons. Beneath the trees is a beautiful gold tree skirt. 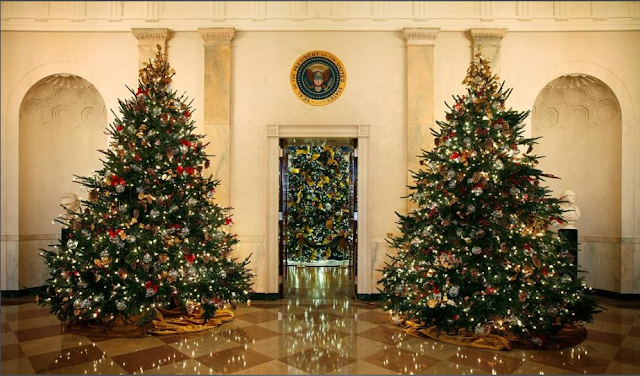 These Christmas tress stand guard around the door leading to the official Christmas tree in the Blue Room. 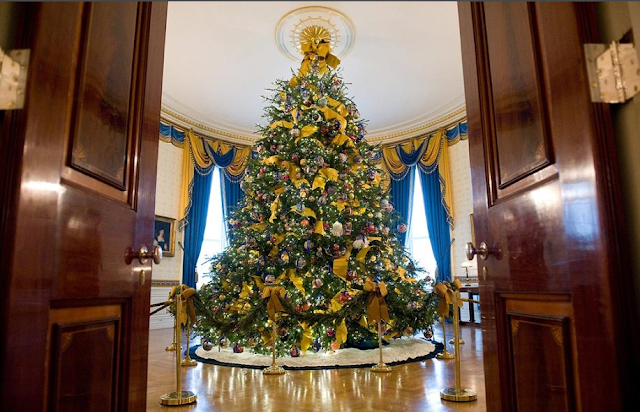 The official Christmas tree of the White House is in the Blue Room and is adorned with handmade ornaments and yellow ribbons. 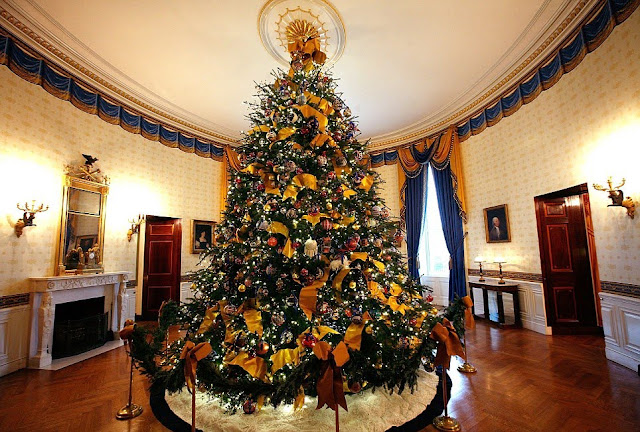 The yellow ribbons on the tree look so beautiful in the blue and gold room. 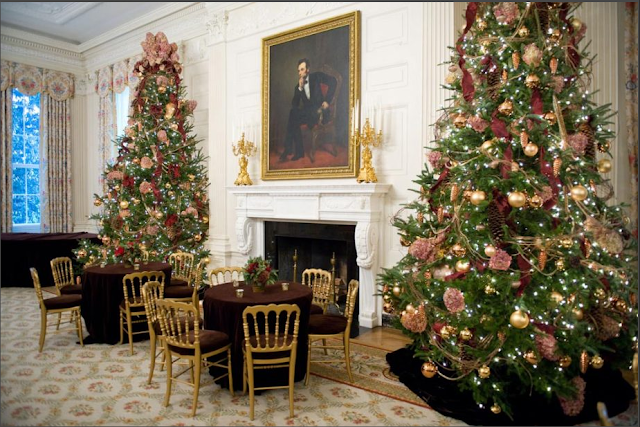 Past Christmas trees in the White House have been equally as gorgeous. 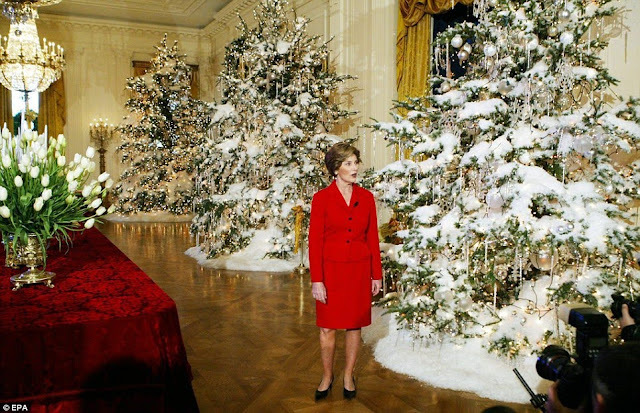 In 2004, the White House had trees decorated with snow and icicles. 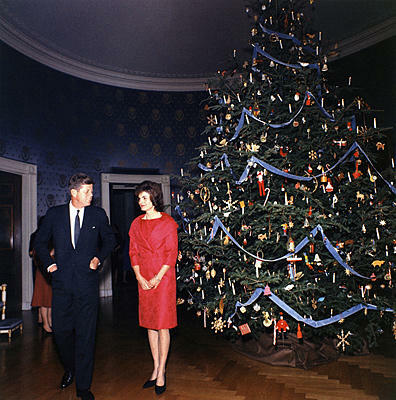 And back in 1961 during the Kennedy administration, the White House Christmas tress was decorated with blue ribbons and lively ornaments. 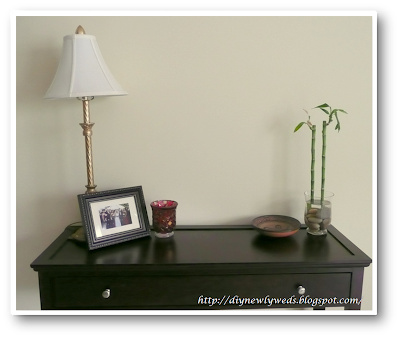 You may have noticed something when I posted photos of my console table decorated for Halloween or when I posted photos of the bamboo hurricane planter I put together. Actually, you may have noticed a lack of something. For far too long, the space above my console table in my living room has been sadly blank. The wall has been empty, waiting for the perfect mirror to come along and decorate it. 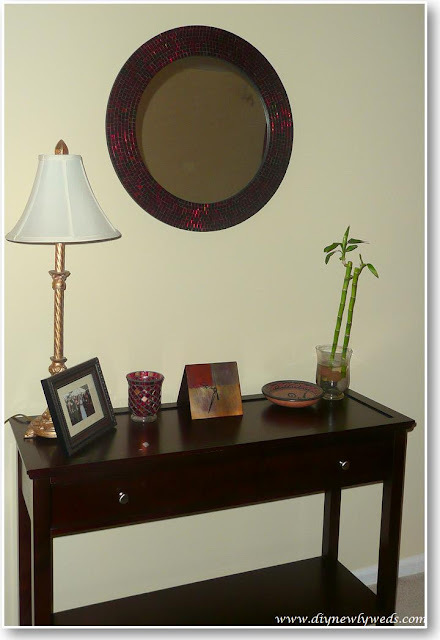 For quite a while, I was shopping for a round decorative mirror. Something red and mosaic would be perfect. I finally spotted this beauty at Pier 1, but it’s $69.99 price tag was too hefty for me. But after waiting for far too long, my patience finally paid off and the mirror went on sale for $49.99. I think I waited a little too long to save $20 bucks, but regardless the mirror is finally mine. 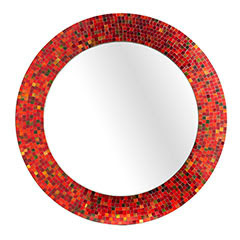 Here it is, my beautiful new red mosaic mirror! This year, despite my better judgment, I braced myself and shopped the early morning Black Friday sales. This was my first year getting to the stores so early and it was a mad house! Although, I should have expected a mad house considering I was at Wal-Mart at 4am amongst a store full of half-asleep shopaholics! I didn't get the new computer I wanted at Wal-Mart, but I did get some great online deals and some great sales at Target later in the day. If you've checked your email today, you've probably gotten bombarded with a slew of "Cyber Monday" offers. If you're not familiar, Cyber Monday is the first Monday after Thanksgiving where retailers promote special online sales. It's like Black Friday on your computer, without all the long lines or waking up at 3am. To compete with Best Buy, Wal-Mart has unveiled some great deals on electronics. These electronics are probably too pricey for most people to dish out as gifts, but if you're in need of a new tv, digital camera, or laptop you can find an excellent deal. I hope everyone had a wonderful Thanksgiving. My Thanksgiving weekend was filled with family, good food, and shopping. So in other words, I had a wonderful holiday! I didn't host Thanksgiving Day dinner, instead we went to both my in-law's and my sister's house. I of course brought a few dishes to each dinner. My favorite Thanksgiving dish to make is my turkey shaped fruit salad. The recipe is a little late to share for this year, or extremely early for next year's celebration depending on how you look at it, but I wanted to show off my creation! 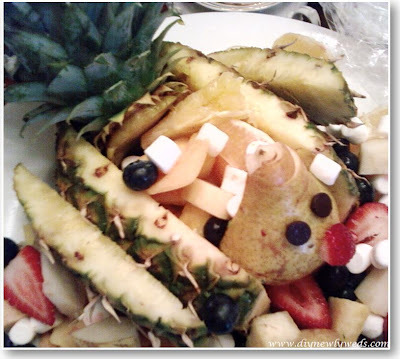 Fruit salad is a staple at any holiday dinner but to make it extra special for Thanksgiving, I created a turkey shaped pineapple fruit salad! With a little creativity, this turkey shaped salad is easy to create and will make a big impact at any party. To start, cut off the leafy top of a pineapple and one side. The leafy top will become the turkey's feathers and the one side will become its wings. 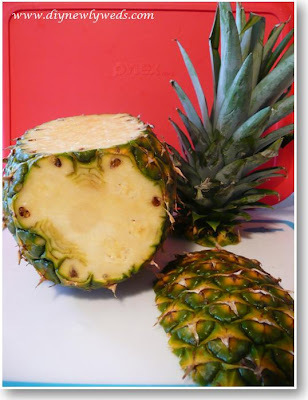 With these pieces of the pineapple removed, lay the pineapple on its side and slice out the center of it as shown below. 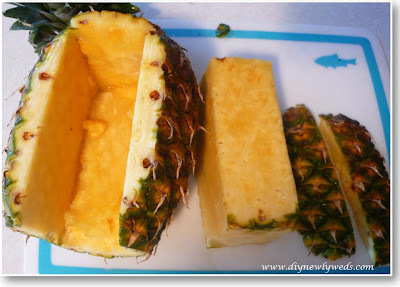 Cut the removed chunk of pineapple into cubes to use as the edible portion of the fruit salad. Next, take the first side you removed and cut it in half length-wise. This will create 2 turkey wings. Secure these wings to the side of the pineapple (the turkey's body) with tooth picks. Then, take the leafy top of the pineapple and attach it to the bottom of the pineapple (the turkey's back) with toothpicks. To make the face of the turkey, I sliced a pear in half lengthwise. I added some chocolate chip eyes and a strawberry beak/gobbley part. 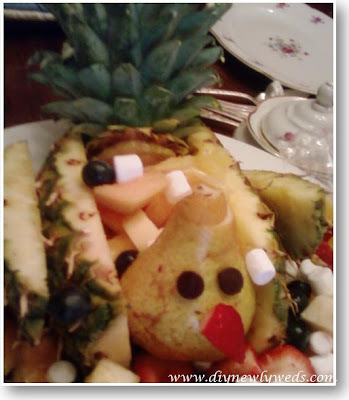 Attach the pear to the front of the turkey pineapple body with another toothpick and fill the pineapple with the fruit of your choice (and mini marshmallows if you have a sweet tooth like me). Since the inside of the pinapple isn't very large, I usually lay the "turkey" on a plate and surround it with more fruit. Tada, your very own turkey shaped fruit salad! A few years ago, I made a variation of this Thanksgiving turkey fruit salad. 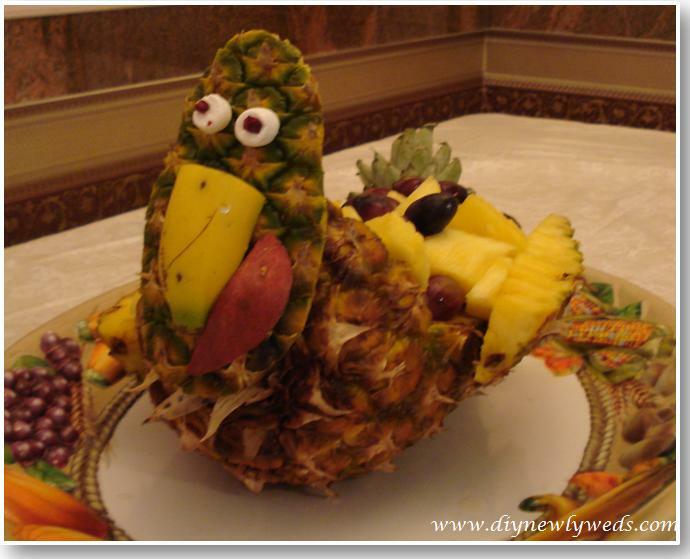 Back then, I cut the pineapple differently and used one side of it along with a banana, apple, and marshmallows to make the turkey face. This year's turkey was easier to make however. How was your Thanksgiving? Did you make any special dishes or decor? This project is shared on Diy Day. 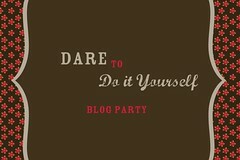 I'm also joining the Dare to DIY Party. Between some computer problems and traveling, I've been out of blogging action for a couple of weeks. But I'm back now and ready to share my latest decorating, and other, adventures. (I did post my final backyard makeover reveal in case you missed it). This past week, Rob and I had a belated anniversary celebration trip and traveled to Las Vegas! It was our first trip to sin city and we were very impressed with the grandeur and magnificence of the city and it's casinos and hotels. I'll share more of the impressive sights later, but for now here's a look at our hotel. We stayed at the MGM Grand in the West Wing, their newest addition to the hotel. The room's decor was very modern and made the most of a not-so-large space. It reminded me of the W hotel in San Francisco which I recently stayed at. The room featured stripes and modern colors which worked well together. The carpeting is striped with blue and gray, while a desk chair is striped with shades of red and gray. A large bolster pillow on the bed pulls the look together with the colors of the carpet on one side and the colors of the chair on the reverse side. The room is accented with a red upholstered headboard, matching red chair, and modern lamp. 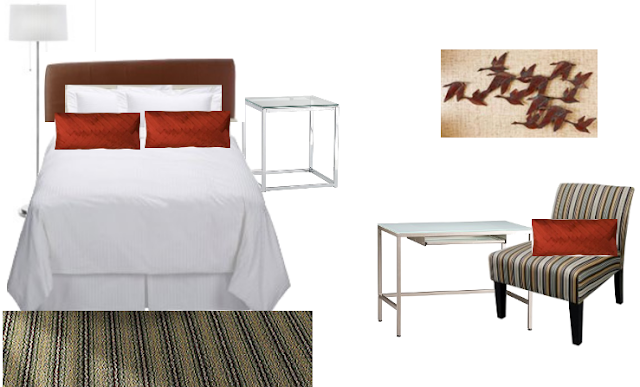 Total cost: $933.71 For under $1,000 you can recreate this modern bedroom look from the MGM Grand West Wing hotel. So we added a fence and installed a patio. Once the patio was installed, we were ready to add plants, outdoor decorations, and areas for cooking, dining, and relaxing. We had about two feet on each side of the patio between the fence and patio edge. Rather than leaving the sides with grass which would be difficult to mow, we added flowers and plants to each side of the patio. 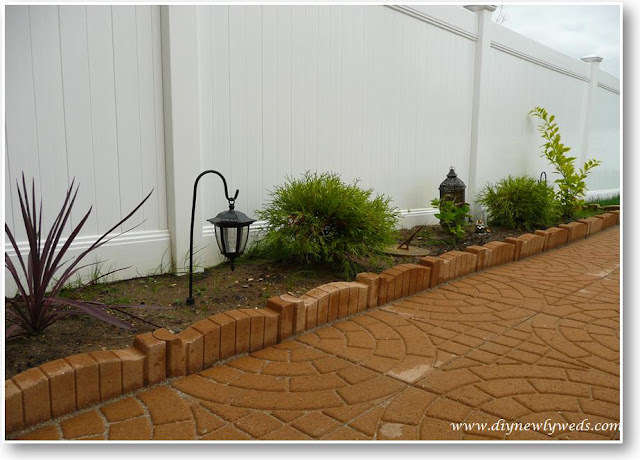 To set the plants apart from the patio, we installed patio paver edgers. We bought these from Home Depot and they were surprisingly easy to install and made a big impact by helping the patio look more finished. Once all the dirty work was finished, it was time for the fun stuff: decorating and furnishing! After a costly patio installation, we needed to keep the furnishings budget friendly so we re-used a few items we already had and bought a few new items on clearance sales. 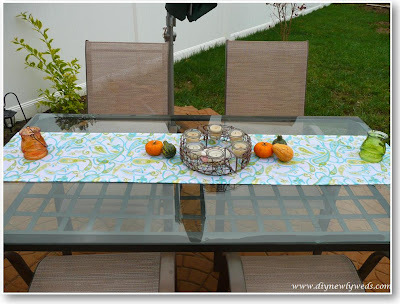 We created an area for dining by re-using an old glass and metal kitchen table from Ikea and by purchasing some outdoor patio chairs from Walmart. I accessorized with some candles and a table runner bought on clearance at T.J. Maxx. 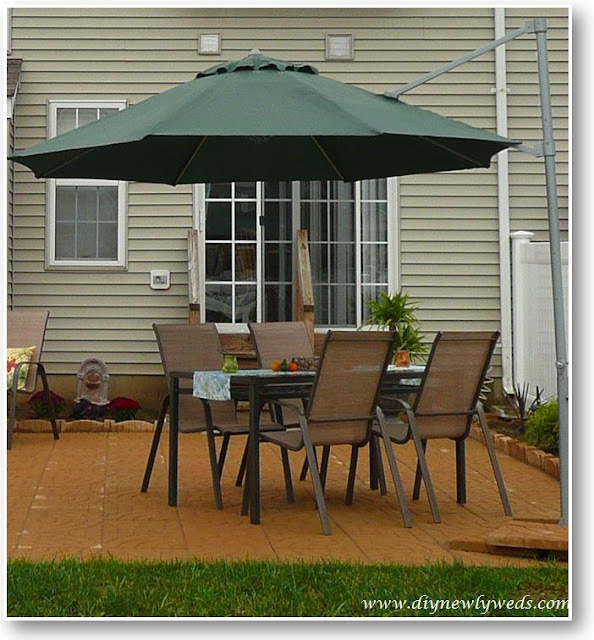 An off-set patio umbrella completes the dining area. Separate from the dining area, I wanted to create a space to relax or curl up with a book. I bought a wicker loveseat from the home section at Ross and paired it with two more patio chairs from Walmart. Then, I found a wicker coffee table on clearance at Target. Although the wicker is a different color than the loveseat, everything worked together once I added some floral print pillows which play off the floral print of the loveset cushion. We also added a barbecue, small garden fountain, little decorations, some potted plants (remember those great garage sale planters I bought), and planted a crape myrtle tree. I even found a hammock on clearance at Lowes. 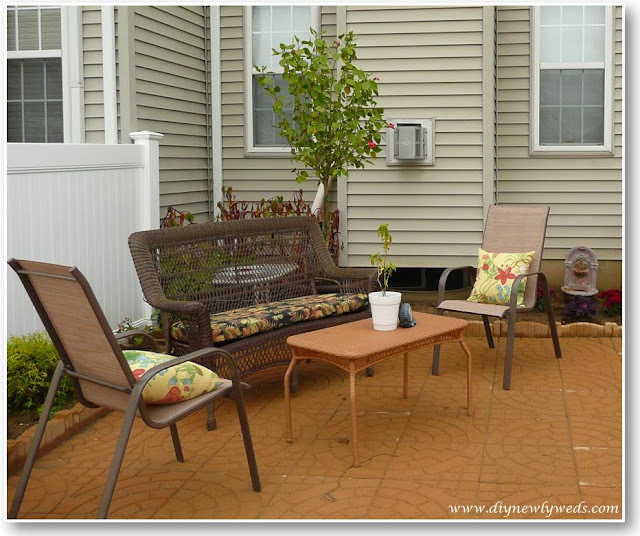 And finally, our backyard patio transformations was done!! 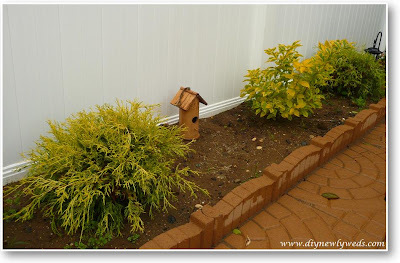 This project is shared on DIY Day, Metamorphosis Monday, Make It Monday, Made It Mondays, Thrifty Decor Chick. Recently, I've been sharing our backyard makeover. We started by adding a fence and then installing a patio. The patio was seriously hard work and our diy installation included digging a giant hole, putting down a weed barrier, adding a 5 and a half ton layer of rocks, and about a three tons of sand. Once all of that was complete, it was finally time to put down the actual patio pavers! We needed to do some more heavy hauling since the pavers were dropped off on our driveway and needed to be brought into the yard via wheelbarrow. 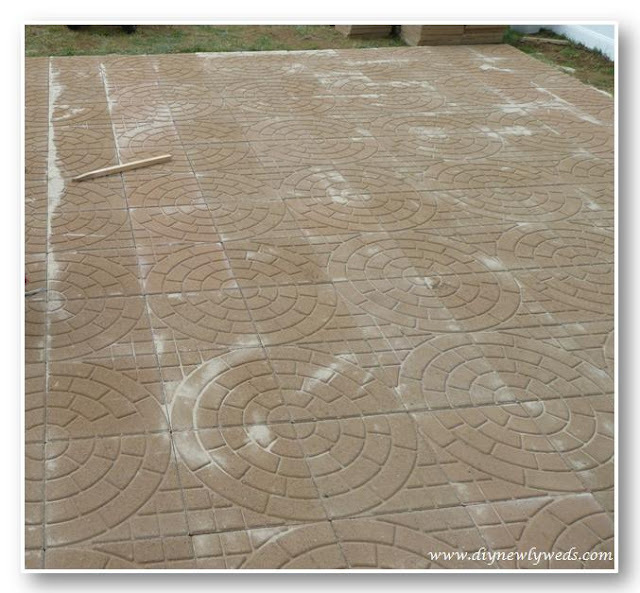 But once all of our groundwork was done, it was fairly simple to put down the patio pavers. The trick was to be patient to ensure the sand layer was level so the patio pavers were put down evenly. However, to ensure proper drainage away from the house we sloped the patio by a few inches. One by one, we put down each patio paver until we were finally done! Once all of the pavers were down, we added more sand on top of the pavers and brushed it into the seams. We finished up by watering down the entire patio area to solidify the sand and secure all of the pavers in place. After a few weekends full of very hard work, we finally had our patio! Of course, we still weren't done the total backyard renovation! We still needed to add some furniture, decor, and plants. 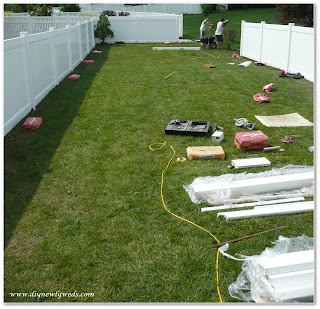 Check back to see how we put the finishing touches on our backyard makeover. This project is featured on Transformation Thursday. With Halloween over, it will soon be time to pack up my spooky Halloween decorations and replace them with less ghoulish autumn and winter decor. I've come across some great fall and winter decor accents online and it's time to play another round of my price match game! If you're not familiar, from time to time I seek out very similar furniture and decor items in multiple stores and then match them up to see if the cheaper items can be distinguished from their pricier counterparts (check out the lighting fixtures and bedroom furniture comparisons for more fun). First, up birch tree bark candles. The warm fire from these rustic natural looking birch candles is sure to make you feel cozy. Next, tree branch wall art prints. For less than you think, you can add these modern tree branch art prints to your home. Lastly, some more candles. It's hard to tell these gourds and pumpkins are actually candles. Now for the results! Did your guess match up? 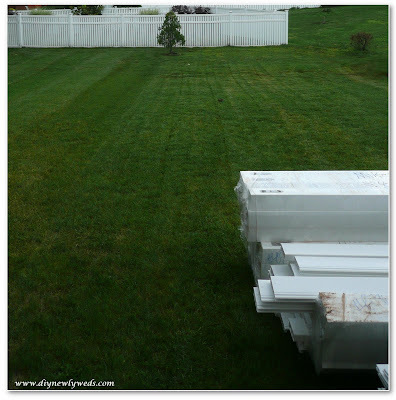 Last week, I featured the start of our backyard renovation. When we moved into our house, our small backyard was a complete blank state with just grass and a lone evergreen tree. The yard desperately needed privacy and an area for barbecuing, dining, and entertaining. We started our backyard makeover by installing a fence for privacy and to define our yard from the adjacent communal space and our neighbors' yards. Once the fence was in, thanks to some muscle power from Rob, it was time to create a place where we could barbecue, eat, and relax. 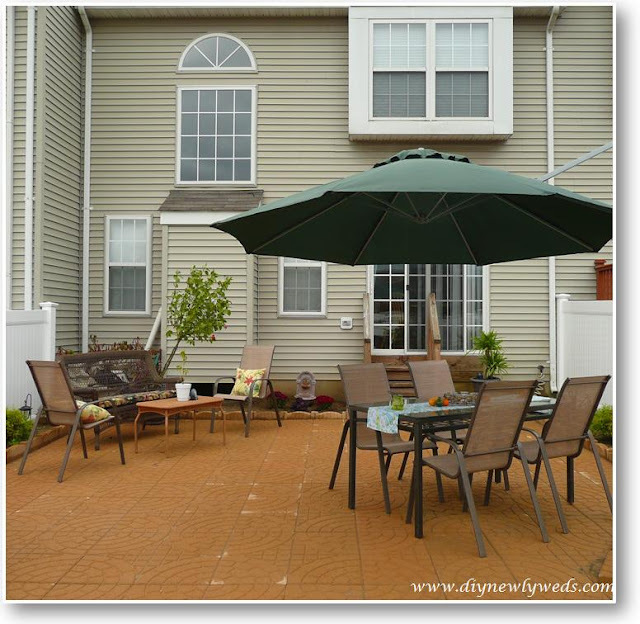 We debated between a patio and a deck, but ultimately decided on a patio. Because we could only get a 5 foot tall fence, a high-set deck would have towered over it and not provided us with enough privacy. Instead, we chose a 20' x 20' patio which would be more private since it sits at ground-level. After researching online, reading books from the library, and advice from friends we decided to install the patio ourselves. But we quickly found out that a 400 square foot DIY patio installation is seriously hard work! I think our poor muscles might still be hurting! First, we needed to dig 8" deep across the entire patio area to dig up all of the grass and soil. This was very strenuous, because it turns out that grass and soil are very heavy when you are digging big 8" thick chunks. It took us about a day to dig out the entire patio area. After the area was dug out, we needed somewhere to put the discarded sod. Since our yard slopes down, we placed the sod chunks in the back of yard to level it out. Next, we lined the patio area with a barrier landscaping cloth to hopefully prevent weeds from growing up between the patio stones. Then, we put down a layer of rocks across the entire area. The rocks were a challenging task as well because we had five and a half tons (literally) of rocks delivered to our house and dropped on our driveway. 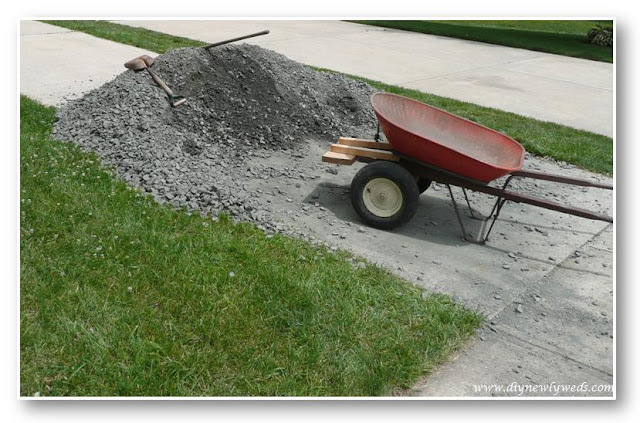 Then we had to carry the rocks around the house to the backyard, one wheelbarrow at a time. We made sure to put more rocks at the front so that the finished patio would slope down a bit for drainage. Once the entire area was fully covered with rocks, we use a hand tamper to compact the rocks so they would form a solid base. With help from our family, we were able to put down the rock base in one very long day. 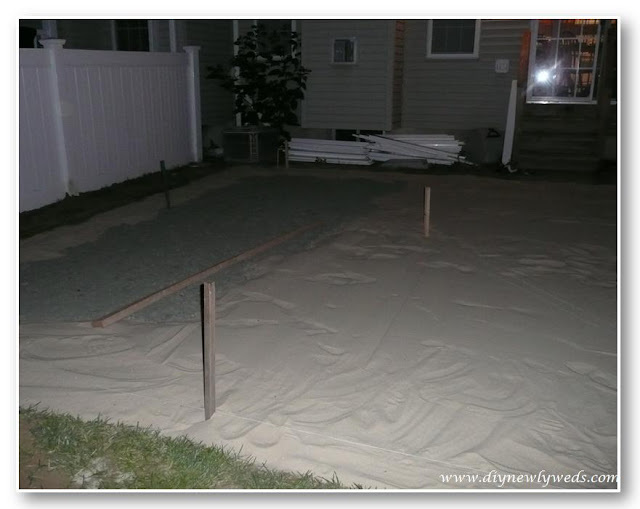 Once the rock base was in place, our next step was to put down a 3 inch thick layer of sand over the entire patio area. Using the wheelbarrow, we hauled 50 pound bags of sand around the house to the yard. 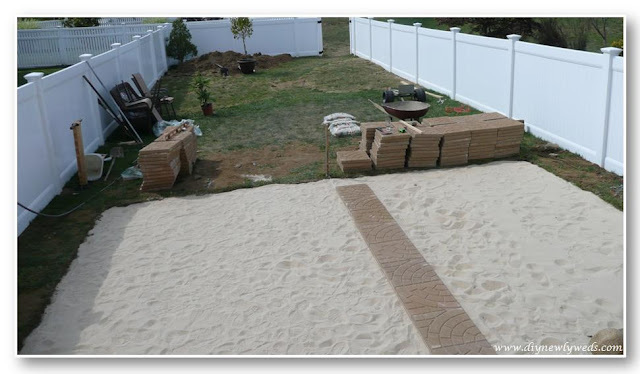 The sand was used to smooth out the bumpy rock base so there was a level area to put the patio pavers down. 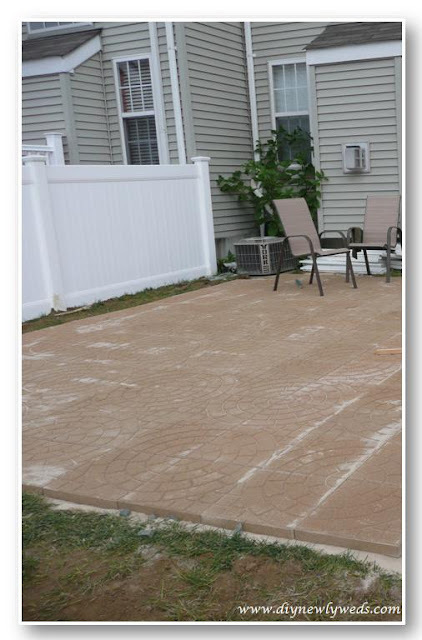 Once the sand layer was down, it was finally time to place down our patio pavers! 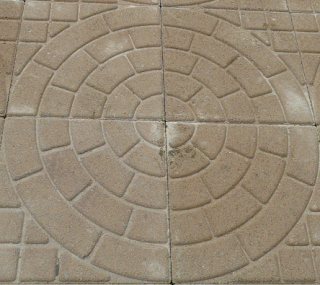 Stay tuned to see the pavers we chose and how we finished our DIY patio installation. This year, I've been extra excited to decorate for Halloween because it's our first year celebrating the holiday in our new house. We don't own too many Halloween decorations yet, but I was able to create a spooky look by pairing the few Halloween items we have with some of our everyday decor pieces. With a few small changes, I transformed our console table into one you might find in Dr. Frankenstein's house. First, I replaced our framed wedding photo with a spooky looking Victorian-aged photo I found on a free stock photography website. 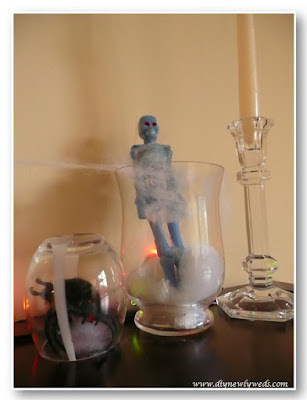 Then I added a mad-scientist look by placing a blue skeleton in a hurricane vase and trapping a big fake spider under a glass candle holder. To fill out the space, I played off the glass specimen jars and added a few white candles including the crystal candle holders we recently used for our first anniversary party. 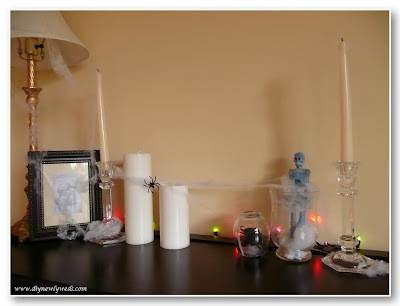 I topped everything off with Halloween cobwebs and back-light the table with green, purple, and orange Halloween string lights. What do you think? 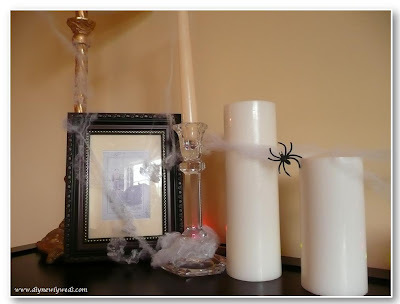 Does my Halloween console table give you the chills? When I'm not working on DIY projects for my house, like the backyard transformation we've been cooking up, I love reading other blogs. I regularly read over 25 blogs and a small portion of my favorites are listed to the far right. It's so interesting and inspiring to see what other people have done in their homes using creativity and elbow grease. And once a project is complete, I love to sit back and admire my hard work. 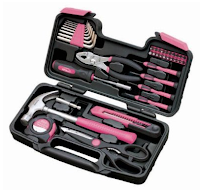 Have you done a DIY project in your home recently? If so, I'd love to see it and share it here. If you have a DIY project that you'd like to share, please email me the details and some before and after photos and I'll feature your project here! 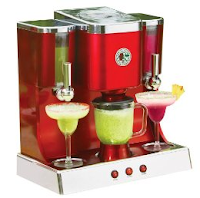 It can be anything from revamping a piece of furniture to a total room makeover. You don't need to have your own blog to submit, but if you do I'll link over to you of course. I can't wait to see what types of projects everyone has been working on! We spent the summer being very busy bees. Although it’s not very timely, I’m finally ready to reveal our biggest home project yet….a complete backyard renovation! Although we have a fairly small backyard, it’s much larger than the rest of the yards in our townhouse neighborhood. But when we bought the house, the yard was completely empty and had no landscaping. We didn’t even realize how much longer our yard was than our neighbors’. To make the most of this someday selling point and to add privacy and enjoyment, we took on a big landscaping and hardscaping endeavor to transform our empty little plot of land into our little oasis. Remember that old Michael Jordan commercial where he had “nothin’ but net”? Well we had nothing but grass. The only thing we had growing on our land was a lonely Charlie Brown-esque evergreen tree and a large weed behind our air conditioning unit. This made for a less than desirable and not very usable yard. Although this complete blank-slate meant a lot of work, it also meant we had free reign to design the perfect yard for us (well, as perfect as our piggy bank would allow). 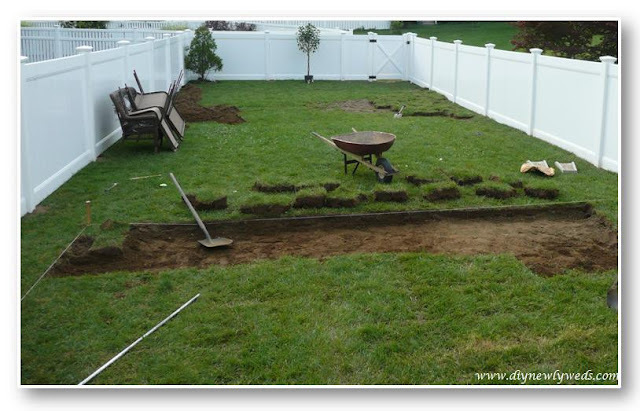 We started off by tackling our biggest backyard challenge- the complete lack of privacy. Although living in a townhouse community has a lot of benefits, the lack of privacy is its biggest drawback. Without any question, we agreed that good fences make good neighbors, and installing a fence was a must. We were tired of neighborhood kids riding their bikes across our backyard and wanted to enjoy our soon-to-be oasis without any peering eyes or having to stare at our neighbor’s yards and houses. 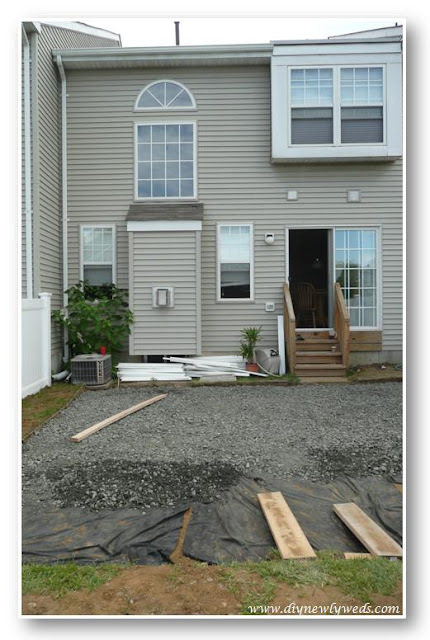 However, living in a townhouse neighborhood also means that we have to abide by rules set forth by our homeowner’s association. This means we were obligated to get a 5 foot white vinyl fence. I would have really preferred a 6 foot fence for extra privacy, but 5 feet is all we are allowed. But we were able to pick out the fence style so we chose a complete privacy fence which has to gaps between each fence slat. To cut costs, we enlisted the help of a friend who is a contractor and agreed to install the fence along with Hubby’s help for a discounted price. It was grueling, but Rob and our contractor friend installed the fence in 2 days. I was amazed that in just a couple of days we were able to add privacy and definition to our yard. Unfortunately for our muscles, this was only the start of our backyard renovation. Stayed tuned to see how we completed our backyard makeover. This project is featured on DIY Day. Recently I stayed at the W hotel in San Francisco and was really impressed by the hotel's decor. One of my favorite elements of the hotel room was the desk and work area. The desk area made great use of space with a sleek desk, cube shelves, and a wall mounted flat screen tv hidden inside a wall cabinet with sliding mirror doors. 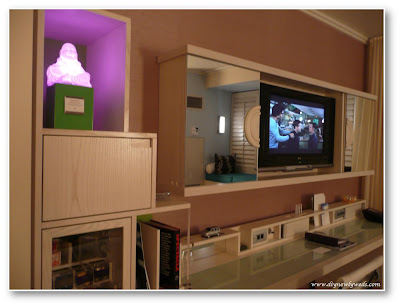 It also had fun touches like a color changing Buddah lamp, kaleidoscope, and bright green accents. 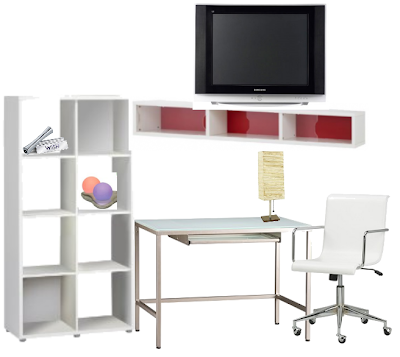 A white desk with glass top from CB2 is great look-a-like desk with a reasonable price tag. 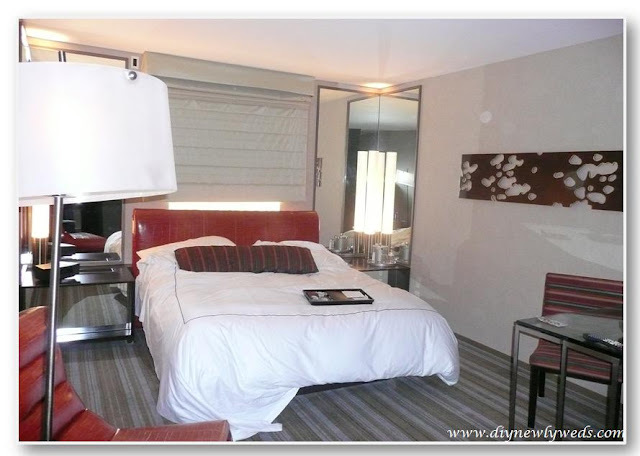 A white modern office chair from CB2 is a nearly identical match to the chair used in the hotel room. The paper desk lamp from Target recreates the look of the paper wall sconces hung on the room's opposite wall. A horizontal wall cabinet with sliding doors from Ikea is a similar look to mount underneath of a flatscreen tv, complete with a bright background color. Bookshelves from Target complete the room's look and add sleek and modern storage. Color changing orbs from Target and an authentic kaleidoscope from the W store add some fun touches and finish the room's look.